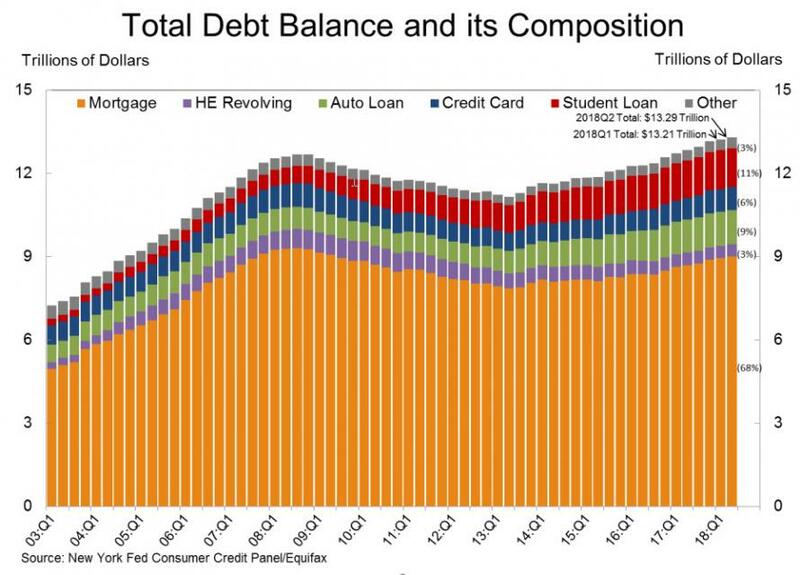 With outstanding credit card debt hitting a new all time high virtually every month, banks are starting to get spooked about their subprime exposure again. According to the latest Transunion Industry Report, in the second quarter of 2018, credit-card issuers slashed the average credit line availability to subprime borrowers by 10% from a year earlier. That contributed to a 3% decrease in the average borrowing cap on new credit-card accounts, to $5,649, the first drop in at least three years. However, even as they trimmed total credit availability, banks tried to make up for declining balances with more clients and subprime originations rose 4% Y/Y. As Bloomberg notes, the pullback is a reversal after years of banks easing their underwriting standards as part of push to grab market share in credit cards, and paradoxically comes at a time when senior loan officers told the Fed that loan standers had loosened in recent weeks. Meanwhile, investors are growing skittish over the potential for defaults to rise, and their worries increased last year when the amount of outstanding card loans passed a record set just before the global financial system almost collapsed in 2008. "The origination decline was led by near-prime and above credit tiers, reversing the growth in the prior quarter and shifting back to the declining trend seen in the previous five quarters" said TransUnion's Paul Siegfried. "Despite originations decreasing overall, subprime bankcard originations grew for the first time in five quarters. However, this expansion has been deliberate as lenders have reduced credit lines on subprime accounts" he added. "We’ve seen a much more surgical approach to assigning credit card lines,” Matt Komos, TransUnion’s vice president of research and consulting, said in an interview with Bloomberg. Lenders are “still originating subprime and near-prime consumers, but they’re adjusting credit lines to kind of manage exposure." As shown in the table above shows, TransUnion also found that the share of credit-card loans that are at least 90 days past due continued to rise in the second quarter, reaching 1.53%, up from 1.46% a year ago and 1.20% in 2015. That’s still below the 2.71% delinquency rate for the same period a decade ago. According to Bloomberg calculations, the average charge-off rate for the largest U.S. credit-card issuers has increased on a year-over-year basis for the past nine quarters. Finally, Transunion notes that 90+ day delinquencies showed a notable increase of 6.8% Y/Y for baby boomers, who had a 1.1% delinquency rate with $6,363 average loan; Both Millennials and GenXers also saw an increase in their delinquency rate, by 3.3% and 1.5%, to 1.90% and 2.03% respectively; the two age cohorts had average credit card balances of $7,117 and $4,238. So what may have catalyzed the banks' decision to start pulling available credit to subprime borrowers? The most likely answer: rising rates. And with the Fed likely to keep rising well into 2019, expect the contraction in subprime exposure to accelerate, in the process depriving a substantial section of the US population from the primary source of funding, which eventually will trickle down into the broader economy.